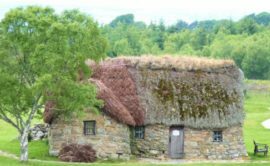 Leanach Cottage Culloden Moor – Culloden Battlefield - J & N Roofing Maintenance, LLC. This impressive house was built in 1730, but beautifully and completely restored in 1960. It is called the Leanach Farmhouse and it is located in Scotland. What’s so remarkable about it? Besides the stone walls and cute little windows, the original roof is the one that stands out. Presently, the little cottage’s roof has the distinctive colors of heather, even though the original one may have been thatched with straw. Culloden Battlefield is located 8 kilometers east of Inverness in the Northern Scotland. It can be easily reached by car (Inverness is approximately a four-hour drive from Edinburgh, Scotland).